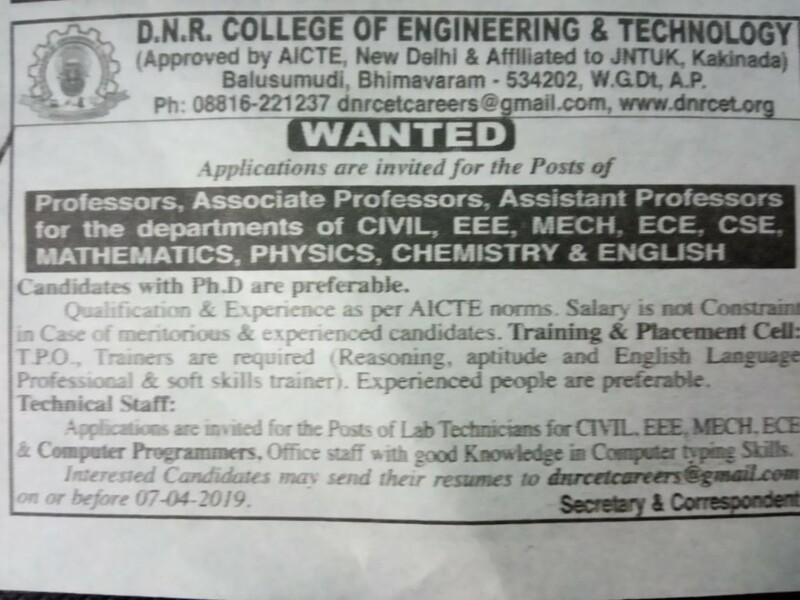 D.N.R College of Engineering & Technology Notification 2019 Technical Staff/Assistant Professor Jobs,Jobs in D.N.R College of Engineering & Technology Recruitment 2019 for Technical Staff/Assistant Professor,Associate Professor/Assistant Professor Jobs in D.N.R College of Engineering & Technology. for Reasoning, Aptitude and English Language Professional and Soft Skills Trainer. They Prefered Ph.D Candidates.Interested candidates are send the Updated resume to college Email Address is given below for D.N.R College of Engineering & Technology Associate Professor/Assistant Professor Jobs. For these jobs you can apply from 1-04-2019 to 07-04-2019. 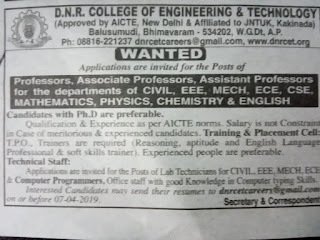 For more details refer the official website www.dnrcet.org for Professor/Associate Professor/Assistant Professor/ Technical Staff/Computer Programmers Jobs recruitment 2019. More details Like Selection Process, Important Dates, Qualification, Salary and e.t.c. Are available given below. Associate Professor/Assistant Professor Jobs in D.N.R College of Engineering & Technology. Starting Date to apply for Technical Staff/Assistant Professor Jobs: 01-04-2019. Ending Date to apply for Technical Staff/Assistant Professor Jobs: 7-04-2019. Eligible candidates are requested to send the Updated resume to college Email Address is given below. Last Date to apply is 07-04-2019.